We are happy to announce the Radical Body Positivity Conference will be taking place in January 2019! This event will be discussing how dealing with issues of race, ableism, transphobia, cisnormativity, islamophobia, anti-Indigenous racism, fatphobia, and other axis of oppression are intrinsically tied to radical body positivity. Much of these ideas have developed from the inspiring discussions and important work taking place in our campus and community spaces. We have brought in artists, writers, activists, and organizers who deal with body positivity in their own unique ways, and have something to share. These include: Hana Shafi (Frizz Kid), Gloria Lucas, and Asam Ahmad. Food will be provided. 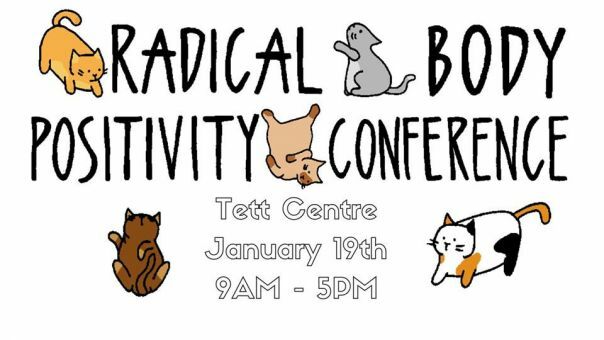 Please join us on January 19th, 2019, from 9AM to 5PM at the Tett Centre (370 King St. West) for a Radical Body Positivity Conference. To accommodate any financial constraints people have, we will be charging pay-what-you-can, with a suggested (but not required!) payment of 30$. We hope to see you there and look forward to taking up space and starting this conversation with you all.